Straw color. Aromas of golden apple, pressed flowers, white peach, and mint with a soft, crisp, effervescent, dryish light body and a sleek, medium-length Meyer lemon, sage, and plantain finish. A dry and palate-opening Prosecco that will make a great aperitivo. Bottom Line: A dry and palate-opening Prosecco that will make a great aperitivo. 89 • Capela Santa Margarida 2016 Red Blend, Alentejo 14% (Portugal) $14.99. 88 • Elodie 2017 Cuvée Florale Rosé, Côtes de Provence 14% (France) $24.99. 85 • En Memoire 2015 Malbec, Bordeaux AOC 12.5% (France) $14.99. 87 • Frederick 2015 Spumante Brut, Chardonnay, Italy 11% (Italy) $14.99. 89 • Giancarlo Ceci 2017 Parco Naturale Red Blend, Castel del Monte DOC 13.5% (Italy) $12.99. 86 • Giancarlo Ceci 2017 Parco Naturale White Blend, Castel del Monte DOC 12.5% (Italy) $12.99. 91 • Inkarri 2016 Estate Bottled, Malbec, Luján de Cuyo 13% (Argentina) $13.99. 87 • Inkarri 2016 Estate Bottled, Bonarda, Luján de Cuyo 13.5% (Argentina) $13.99. 83 • Inkarri 2016 White Blend Estate Bottled, Luján de Cuyo 13.5% (Argentina) $13.99. 90 • Inkarri 2016 Red Blend Estate Bottled, Luján de Cuyo 13.5% (Argentina) $13.99. 84 • Inkarri 2016 Winemaker’s Reserve, Malbec, Luján de Cuyo 14% (Argentina) $17.99. 86 • Inkarri 2017 Estate Grown White Blend, Luján de Cuyo 13.5% (Argentina) $13.99. 88 • Koyle Costa La Flor 2017 Sauvignon Blanc, San Antonio 12.5% (Chile) $16.99. 88 • Koyle Costa La Flor 2018 Sauvignon Blanc, San Antonio 12.5% (Chile) $16.99. 90 • Matarromera 2015 Granza, Verdejo, Rueda 13% (Spain) $11.99. 85 • Matarromera 2014 Granza, Tempranillo, Ribera del Duero 14% (Spain) $14.99. 86 • Niña Bonita NV Organic Spanish Sangria, Valencia 8% (Spain) $11.99. 88 • Paloma 2017 Sparkling Rosé, Italy 11% (Italy) $15.99. 84 • Pizzolato 2016 Moscato, Italy 7% (Italy) $12.99. 88 • Pizzolato 2016 Pinot Grigio, Veneto IGT 12% (Italy) $11.99. 88 • Pizzolato 2016 Paloma Rosé Secco Spumante, Italy 11% (Italy) $14.99. 92 • Pizzolato 2016 Chianti Classico DOCG 12.5% (Italy) $12.99. 89 • Pizzolato 2018 Pinot Grigio, Venezia DOC 12% (Italy) $11.99. 87 • Pizzolato Fields 2016 Prosecco DOC 11% (Italy) $12.99. 87 • Pizzolato Fields 2016 Prosecco DOC 11% (Italy) $13.99. 89 • Pizzolato Fields 2018 Brut Spumante, Prosecco 11% (Italy) $14.99. 88 • Sofos 2015 Greek White, Corinth 13% (Greece) $12.99. 85 • Sofos 2014 Greek Red, Corinth 13% (Greece) $12.99. 86 • Sofos 2015 Greek Red Wine, Korinthos 13% (Greece) $12.99. 84 • Sofos 2016 Greek White Wine, Peloponnese 13% (Greece) $12.99. 88 • Sofos 2016 Red Blend, Korinthos 13% (Greece) $12.99. 84 • Stefany 2015 Extra Dry, Prosecco DOC 11.5% (Italy) $14.99. 87 • Tarantas 2012 Organically Grown Grapes, Tempranillo, Utiel Requena 13% (Spain) $9.99. 85 • Tarantas 2015 Cava DO 11.5% (Spain) $13.99. 87 • Tarantas 2016 Rosé, Utiel Requena DO 12.5% (Spain) $11.99. 86 • Tarantas 2017 Sparkling Rosé, Bobal, Spain 12% (Spain) $10.99. 83 • Vertvs 2014 Tempranillo - Cabernet, Utiel Requena 13% (Spain) $11.99. 89 • Vertvs 2014 Crianza, Tempranillo, Valencia 13% (Spain) $14.99. 89 • Vertvs 2017 Cabernet-Tempranillo, Valencia 13.5% (Spain) $12.99. 85 • Vertvs 2017 Tempranillo, Valencia 13.5% (Spain) $12.99. Prosecco is one of Italy's most beloved sparkling wines. Made primarily from the Glera grape (formerly known as Prosecco), it is generally made in two styles, frizzante (lightly sparkling) or as a traditional sparkling wine. The most famous examples of Prosecco are from the Conegliano-Valdobbiadene area of the Veneto region, but the wine is also produced in other parts of Veneto and even in the neighboring region of Friuli. As the name has not been protected, Prosecco is also used as the name for inexpensive sparking wines made in such countries as Brazil, Argentina, Romania and Australia. As Prosecco is generally priced in the low to mid-teens and has a reputation as a fun, easy-drinking sparkler, it has enjoyed tremendous sales success in the US and many countries. Consume these upon release; while a few examples can age, there is no reason not to enjoy Prosecco as fresh as possible. Drink on its own or with lighter meals (seafood, white meats, risotto) or with fresh fruit. 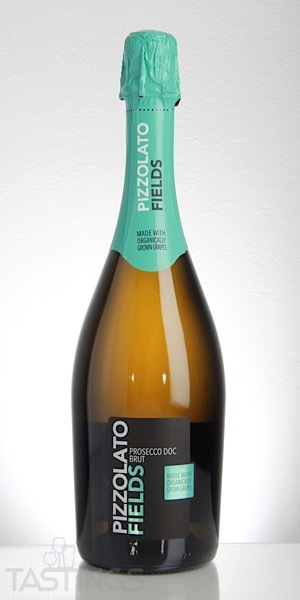 Pizzolato Fields 2018 Brut Spumante, Prosecco rating was calculated by tastings.com to be 89 points out of 100 on 2/19/2019. Please note that MSRP may have changed since the date of our review.